The BMW Group is investing half a billion euros in building the new BMW 3 Series at the Munich plant, where series production launches today. “The BMW 3 Series is the most important volume-produced model from the BMW Group as well as the biggest-selling model in the entire premium segment. To ensure that the sixth generation of the BMW 3 Series likewise leaves the factory in flawless quality, we have invested around 500 million euros in our Munich home plant. And that means safeguarding 9,000 workplaces,” said Frank-Peter Arndt, Member of the BMW AG Board of Management responsible for production, in Munich on Friday. As series production of the new BMW 3 Series Sedan got under way, Christian Ude, Mayor of Munich, along with Manfred Schoch, Chairman of the Supervisory Board of the BMW Group, also spoke before a large gathering of employees at the BMW plant in Munich. The production launch of the sixth-generation BMW 3 Series marks the start of a new era at the Munich home plant. The investments have flowed, among other areas, into innovative production equipment and state-of-the-art manufacturing technologies. They form part of a long-term strategy aimed at strengthening the competitiveness and future viability of the Munich plant and thereby safeguarding 9,000 workplaces in the Bavarian state capital. In doing so, the BMW Group is signalling a special commitment to social responsibility at its headquarters. The production plant in Munich is a firm fixture of the BMW Group’s global production network. It acts as the lead plant worldwide for production of the new BMW 3 Series. All regions across the globe will be supplied directly from the home plant to ensure a simultaneous market launch. Furthermore, it was the Munich plant that determined the assembly sequencing and process architecture for the production of the BMW 3 Series on behalf of the entire production network. Thanks to the standardised manufacturing processes and efficient production systems, the ramp-up at the Munich plant will be very short. Just three months after the start of production of the BMW 3 Series Sedan, peak output of 680 units a day will be achieved. Total output at the plant will then exceed 900 vehicles per day. Munich plant sets benchmarks for modern car construction. Its location within the city presents the BMW Munich plant with some special challenges. The complex production infrastructure, set out across a total area of some 700,000 square metres, calls for extremely high density and means that the most important volume-produced model of the Bavarian premium manufacturer is built on up to five different floors. The smooth coordination between production, logistics, transport and administration within such a confined space is an achievement that ranks as a tour de force in modern-day automotive construction worldwide. State-of-the-art facilities for innovative vehicle production. To ensure the utmost precision and efficiency, new production structures were created for all the manufacturing areas. Building the sixth generation of the BMW 3 Series thus benefits, for example, from a new large press. At 17 strokes per minute, this installation counts among the most advanced in the world. It achieves throughput of 600 tonnes of steel per day and develops press forces of 650 to 2,500 tonnes. In a matter of 12 days, then, this high-performance facility processes a similar amount of steel as went into the construction of the Eiffel Tower in Paris. The new production infrastructure also ensures the highest possible economy of space and optimal material flows. Beyond that, the high-tech press enables an improvement in quality and efficiency. Latest-generation robots are at work in the body shop and paintshop. In the assembly shop, meanwhile, standardised modular product and process architectures ensure high productivity and variability. 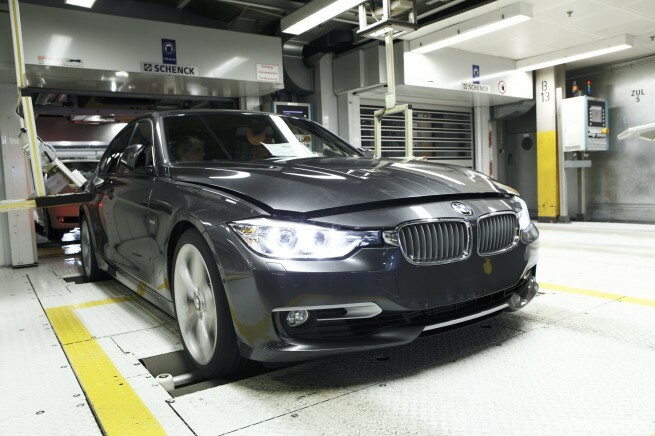 The production process of the new BMW 3 Series systematically applies the BMW Group strategy of multi-version production on the same main assembly line. In other words, different variants of a model series are simultaneously built on the same production line. With these innovative production processes, new manufacturing facilities and cutting-edge technologies, the Munich plant sets exemplary standards for sustainable and eco-friendly production. Among the modernisation measures is also the reconstruction of the logistics, goods inwards and commissioning centre to ensure efficient material supply to the assembly line. Clean production: manufacturing processes now virtually free of non-recyclable waste. With the new BMW 3 Series, BMW has succeeded in implementing production processes that practically eliminate non-recyclable waste and reduce the generation of solid waste, wastewater and emissions almost to zero, as well as cutting noise and vibration to a minimum. Non-recyclable waste has now been whittled down to some eight grams per vehicle. Furthermore, over 60 per cent of vehicles leaving the plant are transported or delivered by rail. With such highly efficient resource management, the Munich plant also marks a milestone for vehicle manufacturing in terms of clean production. Another key priority of the Munich plant is to cultivate good neighbourly relations. Thus great care is taken, for example, to protect local residents from noise generated by the production plant. Noise abatement measures include the use of innovative silencers, ventilation equipment and sound-absorbing cladding, as well as optimised transport logistics. Paintshop odours are avoided thanks to state-of-the-art filtering and regenerative thermal oxidisers. Beyond this, all production processes are subjected to continuous monitoring, which includes assessing the impact on local residents. Munich home plant is the birthplace of the BMW Group. Production at the Munich home plant goes back all the way to 1922. Today, around 9,000 staff from more than 50 nations are employed there. In 2010 alone, almost 206,000 vehicles rolled off the production lines in the heart an urban residential area with minimal impact on the neighbourhood and the environment. The “Today for Tomorrow” scheme has been implemented at the Munich plant. Its aim – particularly from a demographic viewpoint – is to design the workplaces in a highly ergonomic way that takes account of the requirements of a workforce that is increasing in age. The Munich plant is an integral part of the BMW Group’s global production network and the lead plant for the new BMW 3 Series worldwide. 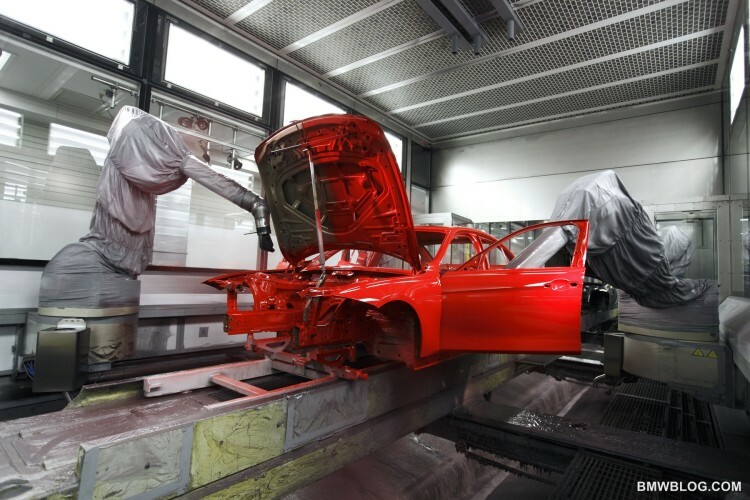 In addition to the core facilities of the body shop, paintshop and assembly lines, the Munich plant also encompasses a laboratory, a press shop, engine construction and toolmaking, as well as interior equipment and seat manufacturing. As such, it brings together the most diverse skills and competences of vehicle production in unique and exemplary fashion. Production currently comprises the BMW 3 Series, BMW petrol engines, and high-performance power units for BMW M models as well as Rolls-Royce. Press tools and body parts are also manufactured for the Group’s global production network. To date, more than 8.5 million vehicles have been built at the Munich home plant.